Google wants you to have fun while using their products and services. Classic Pacman game now has permanent online access at Google website. Now checkout an online game inspired from Gmail powered by HTML 5 technology. It is an online shooting game where Gmail envelope shoot at bad guys. Use left and right arrow keys to position the shooting envelope. Use Spacebar key to shoot flying objects. Use R for restart and p for pause action. 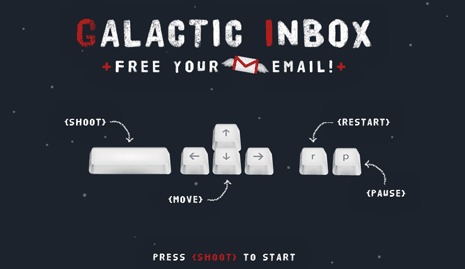 Simple and interesting game for some Gmail inspired fun online within your web browser. Like it?